Unlike the Michael Brown killing in Ferguson, Missouri, there is excellent cause for concern here. But that concern does not mean that facts of the case ought to become irrelevant. The Case. The incident was caught on tape by a friend of Garner’s, and shows Garner, who weighed some 400 lbs., being confronted by police over distributing unlicensed cigarettes (colloquially called “loosies”). The video shows Garner resisting arrest, although not violently so – he shouts at officers, “Every time you see me you want to arrest me, I’m tired of this, this stops today…I didn’t do nothing…I’m minding my business, officer…” while waving his arms animatedly — before Pantaleo comes up behind him and places his left arm around Garner’s neck, bringing his right arm up below Garner’s right arm. Garner raises his hands, falling backwards, at which point three other officers physically grab Garner. He falls to the ground, Pantaleo hanging onto his back with his arm still around Garner’s neck. The officers tell Garner to put his hands behind his head, and Garner complains that he cannot breathe. Pantaleo forces Garner’s head to the cement. It is clear that witnesses do not believe Garner has been put in mortal danger. Garner died a few minutes later. The autopsy from the medical examiner attributed his death to homicide – meaning death at the hands of another party, not murder, in medical parlance – and stated that he died thanks to “Compression of neck (choke hold), compression of chest and prone positioning during physical restraint by police.” But the autopsy further noted that Garner died thanks to acute and chronic bronchial asthma, obesity, and heart disease. So in terms of police cracking down on Garner, the real responsibility lies with Bloomberg and NYPD Chief Bill Bratton. Idiot laws lead to meaningless deaths. That does not appear to have been the case. 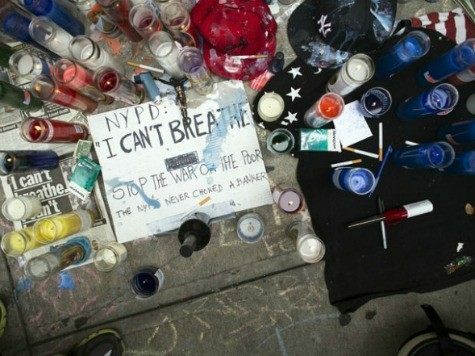 Garner did not die of asphyxiation, as the head of the Patrolmen’s Benevolent Association noted at the time. The preliminary autopsy showed no damage to Garner’s windpipe or neck bones. So what was Pantaleo doing? He was applying a submission hold, which is not barred by the NYPD, and is designed to deprive the brain of oxygen by stopping blood flow through the arteries. So say the experts on submission holds. Excessive Force. There is no clear and concise guideline available on excessive force. According to Mark Henriquez, project manager for the National Police Use of Force Database Project at the International Association of Chiefs of Police, only .44 percent of all force complaints were considered excessive from 1994-1998. Was there any intent by the officers to kill Garner? That would certainly be an uphill case to make, as the grand jury likely found. Did the “chokehold” kill Garner, or did his pre-existing health conditions kill him? If Garner had otherwise been healthy, would he have died from use of the “chokehold”? If not, would use of the “chokehold” have been reckless? Was the use of the “chokehold” reasonable use of force rather than excessive use of force? Was the “chokehold” necessary to subdue him? Unfortunately, in situations like the Garner case, our gut tends to overwhelm our assessment of the facts. We are sickened, as we should be, by the idea that a man died over sale of loose cigarettes – which is an indictment of the law, rather than of the police. We are sickened by the fact that a man died while warning officers he could not breathe – but we must assess whether that death was caused by the officers, or intervening medical conditions. When people’s lives are at stake, it is worthwhile to actually examine those facts, rather than pre-conceived narratives constructed for political gain. And it is worthwhile noting that even if the police did use excessive force against Garner – which, of course, is quite possible – that still does not establish that they did so for racial reasons.